How I do hate the word 'uncomfortable'. Mostly when it's used by a gynaecologist bearing down on me with a plastic speculum; but also when it's uttered by the captain of a ferry I'm trapped on for the next two hours. Crossing from the Welsh port of Fishguard to Rosslare in south-east Ireland, we were shunted about by 2-metre swells and it was no fun at all, even with a Scopaderm patch behind my ear: it's a long time to stare at the horizon and concentrate on not hearing all the honking up going on elsewhere in the cabin. But eventually we got back onto terra firma and wound up at the world's "oldest intact still-working lighthouse," said William, choosing his description carefully to avoid any possibility of challenge. Hook Head in County Wexford has had a light since the 5th century, and an actual lighthouse for 800-odd years, so I reckon he's pretty safe. It was a fine and stirring place to be on a blustery day with dark cloud and bright sun and, ever a sucker for lighthouses, I would have been pleased to be there on those grounds alone - but one-third of the way up its 150 steps, we came across an amazing coincidence. Regular readers (hollow laughter) will recall that earlier in this trip, we stayed at the Inner Temple in London - a privilege accorded to members only. Just metres from the door of Dr Johnson's Building was the Temple Church, built in the 12th century by the Knights Templar, they of the Crusades. 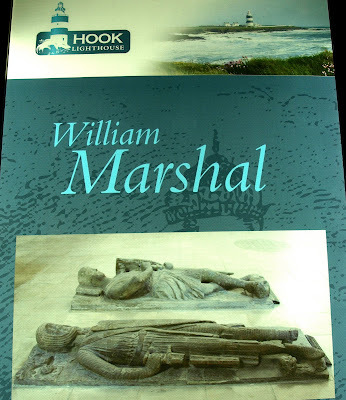 We went in and looked at, amongst others, the effigy of William Marshal who made King John sign the Magna Carta in 1215 and thereby also made his own name, amongst the legal fraternity at least. But something else he did was to found the town of New Ross in Wexford and, to encourage trade there, also built at the entrance to the river, Hook Head lighthouse, where there's a picture of his supine statue back in London. Connections, eh? Love 'em.